Being online is all about branding, and it doesn’t matter how you do it, but the more people see your brand name, the more likely they are to remember it. Because of this, when shortening URLs, it’s a good idea to have a URL with your brand name. Depending on quality, you can also configure the shortener to see stats and other useful details. There are many online resources which let you shorten your long URL links making them much shorter and easier to share on social services. But with a growing need for short URLs (as short URLs are easy to share on sites like Twitter), using a good URL shortening script will help. 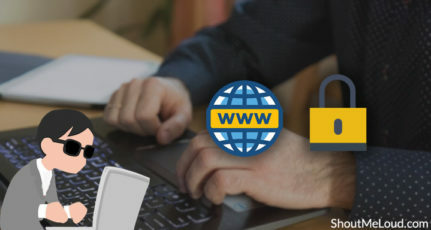 Today, I will be sharing an easy to follow tutorial for those who would like to self-host a URL shortener using their own domain name. If you own a domain, there is a very easy way to do this with very little technical skills required. This service is free to use & all you need is a domain name in your GoDaddy account. To get started with this, head over to Shortener.godaddy.com & login with your GoDaddy account. If you don’t have an account, head over to GoDaddy’s main page & buy a domain name. 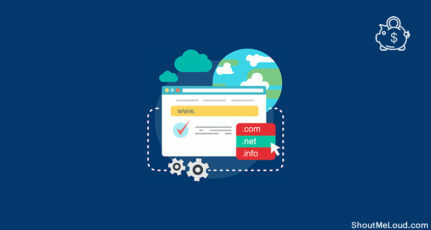 It’s recommended to buy a 3 or 4 letter domain name to keep your URL short. You can also transfer your existing domain name from other registrars to GoDaddy & then use GoDaddy’s URL shortener. If you are planning to do that & need a guide for the same, let us know & one of ShoutMeLoud’s members will write out a detailed guide. 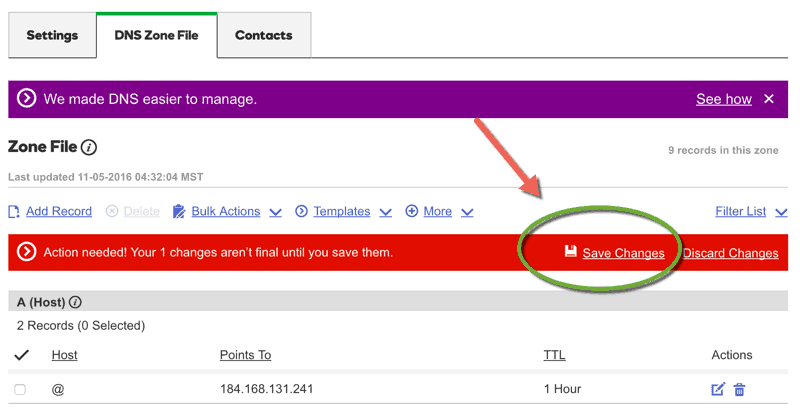 On the settings page, first click on “Help” to get your A & TXT record that we will need to update. This will point our domain to GoDaddy’s URL shortener & then we will be able to further configure everything. Click on “Finish” & on the next page click on “Save Changes”. Similarly, add the TXT Value & click on “Save Changes”. Usually, the changes take effect within 5 minutes. 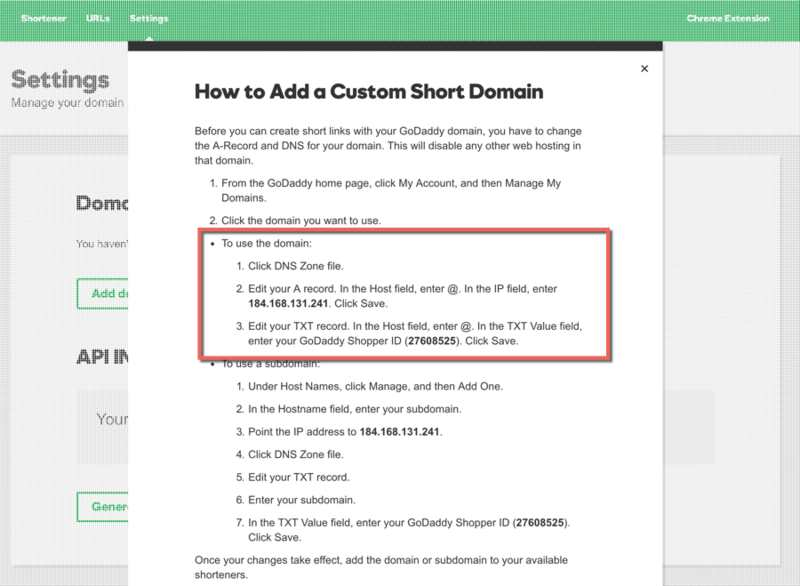 Go back to the GoDaddy URL shortener & click on “Settings”. Base redirects to: When you use your own domain as a shortener, people can use the links you create (e.g. mydomain.com/myLink), but what happens when they go to mydomain.com? By leaving this field blank, users will be redirected to our shortener. Enter another domain, and they’ll go there instead. Case sensitivity: Shortened links that are case insensitive will treat upper and lower case links the same. May 2016 note: These domains are used just for this tutorial & they might not work after some time. One popular method is using the YOURLS script, which is available here on Github. What I like about YOURLS are the plugins. 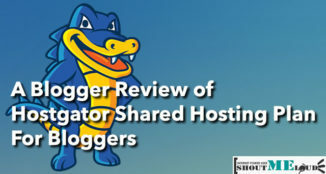 You can add tons of features to your branded URL shortener with these plugins. But running the YOURLS script requires more technical skills than the previous method. If you are accustomed to using FTP, database, and making changes in your core file, you should be able to configure YOURLS with no problems. I recommend you first try it on your local installation of PHP and MYSQL servers. You can refer to the below guides for configuring a local PHP & mySQL server. Another popular method is using Bit.ly to create a shortened URL. 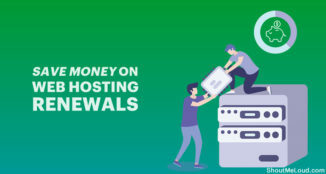 I have been using it for a while but after news about Bit.ly adding affiliate tokens to many shortened URLs under the free account, I wouldn’t recommend it to anyone. 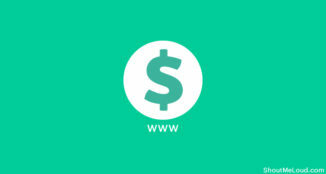 Overall, the GoDaddy method is pretty easy to use & one can get started with his/her branded URL shortener in no time. If you know of any other useful methods to create a custom URL shortener, let us know in the comment section below. If you have found this guide useful, do share it with others on Facebook & Twitter. Bro Did you mean URL like mysite.com/xyz ?????? It means a owned alternative of URL shortener like goo.gl & bit.ly etc. Harsh thanks again introduce to new tips for blogging nice . 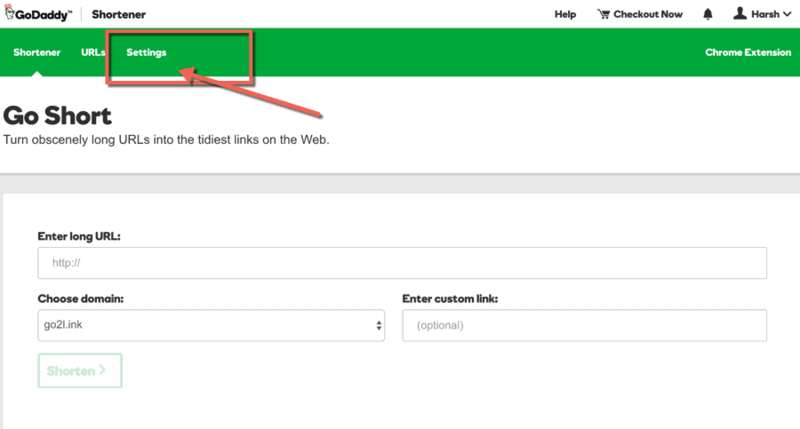 Never Heard of the GoDaddy URL Shortening. Thanks for sharing the useful information with us. Now, These links will make sense. Unlike other shortening services, we can use our own brand name on the shortened link. This type of URL Shortening can be very effective when we share those links on social media profiles. 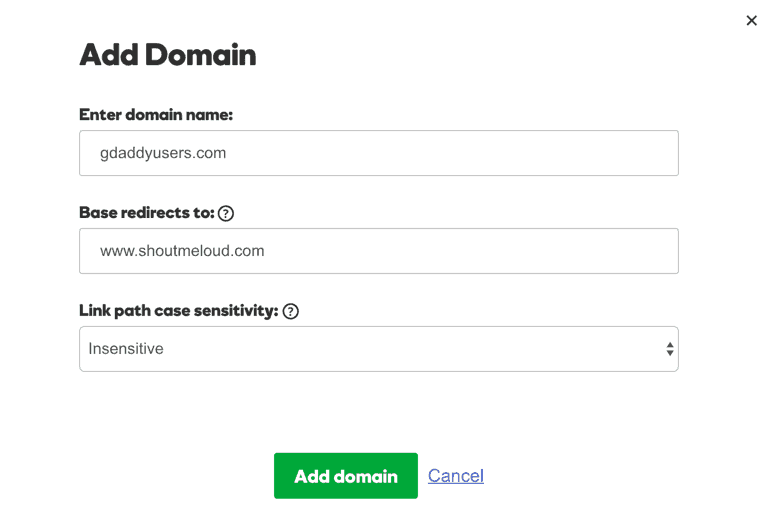 Sir , that means you redirect particular domain gdaddyusers.com to shoutmeloud and after that particular URL of gdaddyusers to wphostingdiscount . 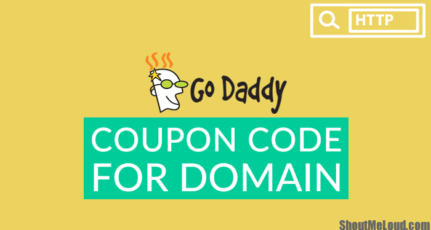 But gdaddyusers and wphostingdiscount both are long domain name and you said it should be 3 or 4 letter? I’m just using this domain as an example. One who wants to take advantage of URL shortener, should use 3-4 letter domain name. harsh nice article and very helpful. however is there any short url service without showing ads or waiting time ? I’m also using godaddy but i didn’t know this feature. Thanks for sharing useful information. I have one doubt what if we are using CloudFlare for DNS hosting ? In that case you will be adding A record & TXT record on Cloudflare. As per other users, CJC99COM coupon is for new users only. Most of popular tech blogs and one of them Lifehacker recommend Namecheap instead of Godaddy. I have registered my domain name on Namecheap, So is there any other method? 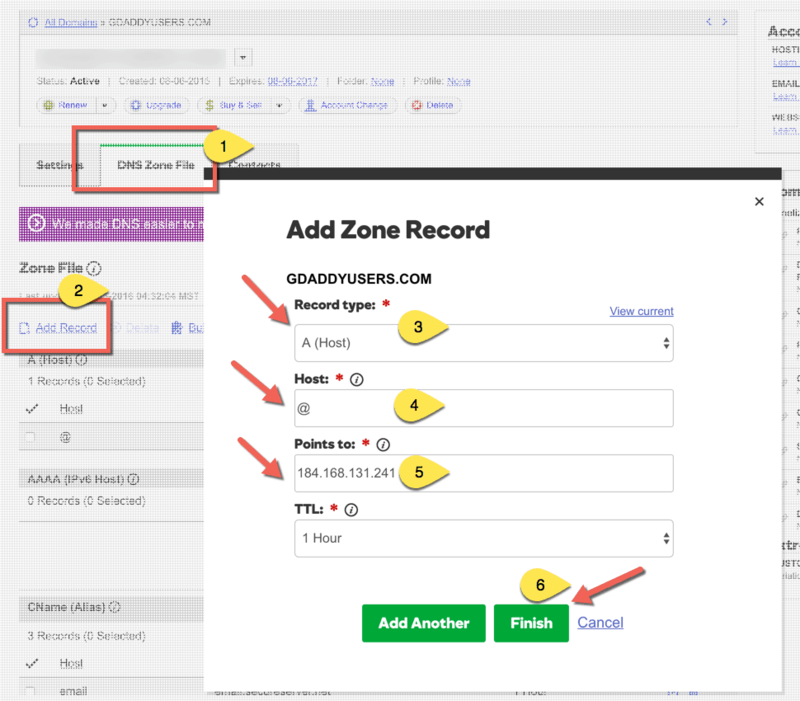 Godaddy is best for this feature! I want to transfer my existing domain name from other registrars to GoDaddy & then use GoDaddy’s URL shortener. I am planning to do that & need a guide for the same please. 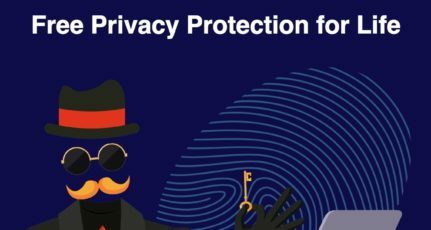 Great article everything explained step by step. Just one quick question. My domian registrar is namecheap not godaddy and they have a different dashboard for these settings. 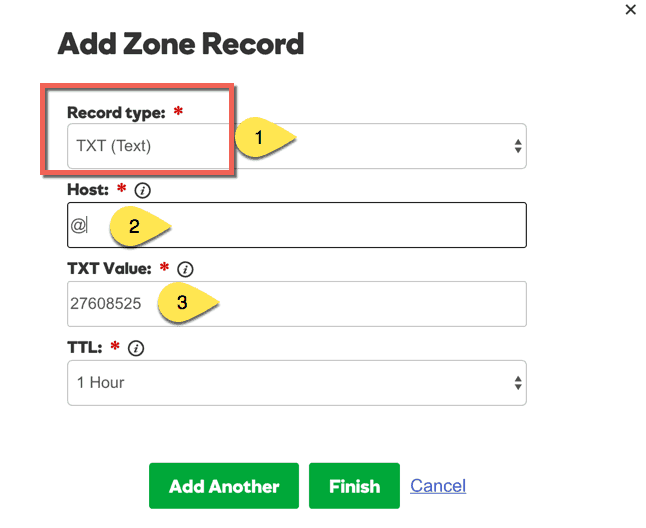 you just need to point your domain from Namecheap by updating the DNS record.